HOMAGE to Sonia Rykiel, who died August 25 in Paris, age 86. Odd name, Rykiel. 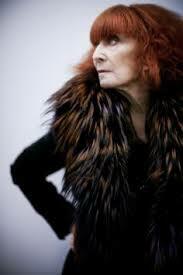 And an odd looking woman, Sonia Rykiel, with her orange-red hair exploding in straight lines around her stark looking features. Why that white face? A statement for sure. She made a lot of women feel capable of such individuality in less dramatic ways. I remember how, during several months’ stay in Paris in the late 1960s, I felt emboldened by her very initials- but more so by the clothes under her label sold in a little boutique on the Left Bank. I remember buying two long wool dresses, one black and the other a patterned brown number. that I could barely afford at the time when I was living in a tiny maid’s room six floors up and freelancing for what was then the International Herald Tribune. Or if they weren’t her label, they might well have been since such styles went against the grain of excess current during a rebellious era. When my somewhat-boyfriend at the time asked me on my return to New York what I had done during my time in the City of Light, I replied ‘I bought some clothes.’ He was the one-in-a-million who seemed to understand and not question my answer or think it frivolous. Because my purchases meant something more than additions to a wardrobe. They identified me with a time and a movement, still nascent, called feminism for lack of a better word. There were no marches or bra-burnings in those days on behalf of women’s rights, although there were riots aplenty among students in Paris, ship workers in Gdansk Poland and anti-Vietnam war protesters at home. It was up to every woman to distinguish herself by whatever lights she chose and not expect anyone to agree or offer support. She made her name with colorful knitwear, some of it tight-fitting but meant for comfort as well as for show. The so-called poor boy sweater decorated whimsically with graphics and rhinestones wasn’t so much a political statement as a way of having fun with clothes and maybe even poking fun at them as well.. I chose two loose simple easy-wear long-sleeved dresses of no particular surface distinction. At least not in terms of crazy let-it-all-out trends erupting in the world. Except they were distinctive for being so well cut and dramatic in their very simplicity. I bought a long black flared wool coat to wear over them. These ensembles and a pair of black lace-up black boot shoes were all I needed to be and feel a la mode, to have made my own statement about my own confident sense of self.